Pelenna Patchworks: Holiday In Kashmir by Moda full range now in stock! Holiday In Kashmir by Moda full range now in stock! 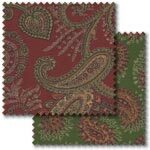 A stunning new range from Moda, Holiday in Kashmir is a holiday range with a difference - magnificent ornamental paisleys shimmer with intricate gold metallic details in a sumptuous array of ivory, ruby reds and sable embellished with accents of deep evergreen and burgundy. 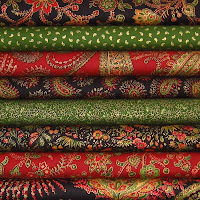 We have the full range of 27 fabrics in stock now, as well as two fat quarter packs and two stash packs in perfectly coordinating colour themes of black and burgundy, and green and red. Makower Christmas fabrics have arrived!